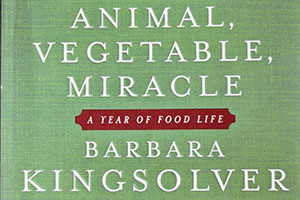 In Animal, Vegetable, Miracle: Our Year of Seasonal Eating Animal, Vegetable, Miracle the Kingsolver family eat homegrown as well as locally grown foods for a year in order to reduce their carbon footprint. However there are some items which they cannot do without even though they grow very far away such as olive oil and coffee. Barbara pens the chapters on the vegetables in season and how the Kingsolvers grow or buy them and how they prepare them, with end caps by husband Steven Hopp and college bound daughter Camille. My favorite passages were, by far, those concerning their six year old daughter, Lily’s, egg business, as well as the bits about the heritage turkeys. I had no idea that turkey sexuality was bred out of them, and therefore turkey females did not necessarily know how to be mothers. Reminded me of women fumbling and foiling at breast feeding because it really is a learned art, and often there is literally no one at home to correct what they may be doing wrong. I was hoping to learn from Animal, Vegetable, Miracle how to grow more local (except for tomatoes I don’t do much else), but this is not that type of book. In fact, there were times when I felt hopeless at ever being able to grow foods and sustain myself let alone my family in the style of the Kingsolvers. Barbara and Steven have both grown up on farms and so have the added benefit of knowing what peg goes in which hole much as I do when it comes to Pakistani recipes and knowing which ingredient should be added when by sheer dint of belonging to the culture. I can no more ‘teach’ someone how to grow local by telling them how lushly the turmeric and cumin and onions grew in my garden, how their colors flowered in my kitchen, or how their smells added to my dreams, then Barbara does in her chapters be they asparagus in March, zucchini in July or pumpkins in October. Also I would have liked to know how much cleaning, and preparation, and cleaning was involved in growing, scrubbing, canning, freezing, storing, slaughtering; an awful lot of cleaning, I dare say, which might put a woman like me, if I had no domestic help, in a very bad mood. But Barbara breezes through the menial chores in so far that they do not crop up in the book much, and certainly not as something bad mood inducing. If I remember correctly, she even says at one point that all the preparation and cooking is actually soothing because her other job i.e. writing, is so cerebral. fruits and vegetables, thank you, we just can’t nurse. From a cow. Okay? But spending every waking hour on one job in drudgery, however you slice it. After an eight hour day at my chosen profession, enough is enough. I’m ready to spend the next two or three somewhere else, preferably outdoors, moving my untethered limbs to a worldly beat. Sign me up on the list of those who won’t maximize their earnings through a life of professionally focused ninety hour weeks. Plenty of people do, I know, either perforce or by choice– overwork actually has major cache in a society whose holy trinity is efficiency, productivity, and material acquisition. Complaining about it is the modern equivalent of public prayer. ‘Work’ in this context, refers to tasks that are stressful and externally judged, which the worker heartily longs to do less of. ‘Not working’ is widely coveted but harder to define. The opposite of work is play, also an active verb. It could be tennis or bird watching, so long as its meditative and makes you feel better afterward. Growing sunflowers and beans is like that, for some of us. Cooking is like that. So is canning tomatoes and making mozzarella. Doing all of the above with my kids feels like family life in every happy sense. When people see the size of our garden or the stocks in our pantry and shake their heads, saying “What a lot of work,” I know what they’re really saying. This is the polite construction in our language for “What a dope”. They can think so. But they’re wrong. from the chapter What Do You Eat in January? I once read a pioneer diary in which the Kansas wife postponed, week after week, harvesting the last hen in her barren, windy yard. “We need the food badly,” she wrote, “but I will miss the company.” I’ve never been anywhere near that lonely, but now I can relate to the relationship. from the chapter Celebration Days. What a pleasant, refreshing surprise to find the Prophet Muhammad in a book on eating locally!! I am so used to the Prophet, indeed anything related to Islam, being mentioned only and only in context to the usual veiling and failings that I reread the above lines twice before trusting mine eyes. Why am I not surprised that the author is Barbara Kingsolver!